It’s always a good idea to learn from others who’ve gone before. But glowing success stories that omit the painful realities of a situation only go so far toward helping you avoid making the same mistakes. That’s why our case studies are different—showing you the good, the bad, and the ugly. Pricing initiatives don't happen overnight and organizational support can wane over time. Without some thoughtful planning, initiatives can end-up fading into the background. Learn the approaches two companies used to keep support and momentum going. An edgy case study that exposes how one company got "creative" to improve profitability without having to change their sales team's ingrained cost-plus pricing behaviors. 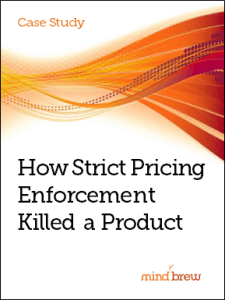 This case history details how one pricing champion used two different approaches to gain support and approval...and got very different results. Find out which approach worked better.